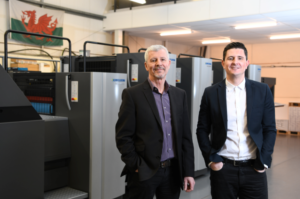 A Cardiff-based printing firm is celebrating its 29th year in business by making a £1M investment in its technology; the first of its kind in the UK. Spectrum Printing, which was established in 1989 by Lawrence Corria Snr, has invested the seven-figure sum as it acquires a Heidelberg Speedmaster CX 75 and studio; becoming the first firm in the UK to purchase the state-of-the-art machinery and technology. Spectrum Printing is the preferred supplier to Welsh Government after coming top in their group in the All Wales Printing Framework.This has allowed the business, which employs a team of 20 from its base in Cardiff Bay, to provide print for public sector bodies and councils across Wales. Other customers include large marketing and communication agencies as well as blue chip businesses in the private sector. Mr Corria Jr continued: “As we edge towards our 30th anniversary, it is incredible to see how long the business has come in terms of clients as well as technology. The print industry may well be under some pressure as a whole, but we are living proof that by taking a pragmatic approach and delivering a quality end-product with a dash of polished customer service, you can still do very well. For more information on Spectrum Printing please call 02920 497 017, visit spectrum–printing.co.uk/, email info@spectrum–printing.co.uk, follow @Spectrum_Litho on Twitter, Spectrum Printing on Facebook and spectrum_printing on Instagram.